I was thrilled when we got the tap to provide interior design in a beautiful center hall colonial in West Orange, NJ. The client’s request was for a kids’ lounge—a place to gather, hang out, and unwind. That said, the adjoining room was designated for homework, group projects, and study. A little something for everyone. We pulled together some of our favorites; the Sahara sconces by Arteriors, side tables by Vanguard, The Old Wood Co. tables, and a hanging chair by CB2 with a custom cushion upholstered by First Option Upholstery. The space is at once playful and open, yet moody, rich, and alluring. 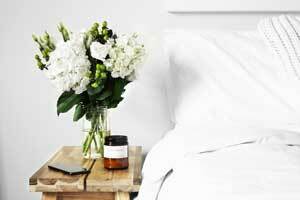 Wanna’ know how to make your home feel more welcoming? I’ll send you tips on how I do it. You have to see how this all began—a peek behind the scenes of one of my favorite interior design projects. The before image above shows where we began. Color played a major role here, one that made a lasting impression on the home. 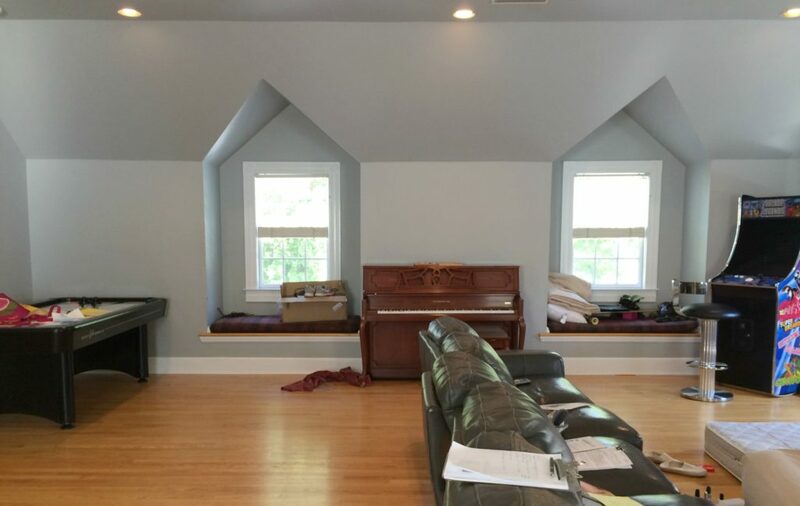 The before and in-progress shots showcase the dramatic transformation. Colors establish a room’s tone and feel, and this project is an excellent example of this principle. We added crisp millwork to give meaning to the window niches—a sense of place. We bumped out the window boxes and connected them to the floor, while drawing the eye up with the floating arches. The plate rail gives definition to both the walls and ceiling, which were previously all running together. Why the bold color palette? 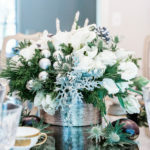 I went full throttle in the front room by using a rich teal color, and wrapping it around the room on the walls and the ceiling. 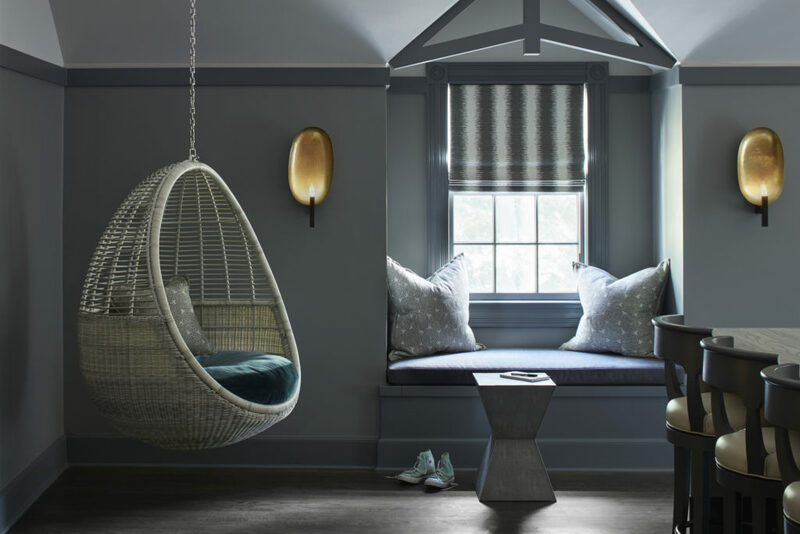 This continuity of color allows the corners of the room to fade away, and the darker shade enables you to focus on the furnishings, the window treatment, and just maybe, the homework. The ceiling in the study room is much lower than in the adjacent kids’ lounge, which the wrapped, rich color accentuates. A classic architectural technique, there is a great sense of expansion as you enter the larger, brighter space. 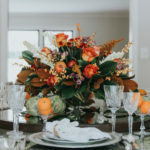 Décor highlights include a Vanguard dining table base in a soft brash finish and dining table top in warm wood tone, a Fretwork pendant by Mr Brown, and cozy pillows in a herringbone fabric by Kravet. Options include a Vanguard sectional sofa with a brass nail border and Vanguard ottomans. 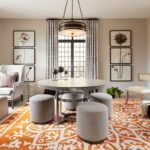 Standout details include a Roark Modular Ring Chandelier from Circa Lighting, custom window treatments by Window Works, The Old Wood Co. tables, and Sahara sconces by Arteriors. The combination of space and comfort translate to a lounge that the whole family can enjoy, and one that adults want to hang out in. 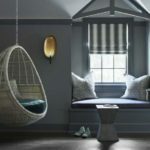 The risk in using a bold paint color is that it can result in the room feeling too dark and cave-like when that is not your intention, or that the color can come out too bright. The lounge is a huge room, so I made sure to select colors that are muted, as color always feels more intense on a larger scale. 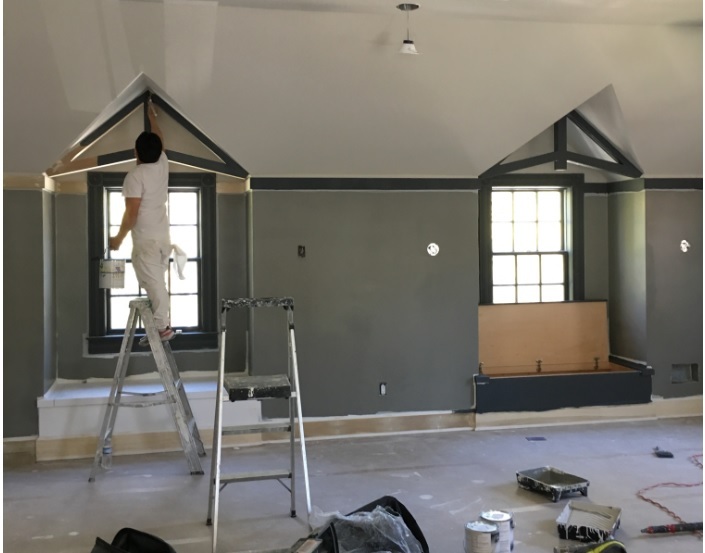 The rich paint colors on the walls and trim by Benjamin Moore add weight and depth to what was previously an architecturally bland room. I used the darkest paint color in the space on all of the trim to highlight these newly added architectural details—the brackets at the window seats and horizontal plate rail around the room. 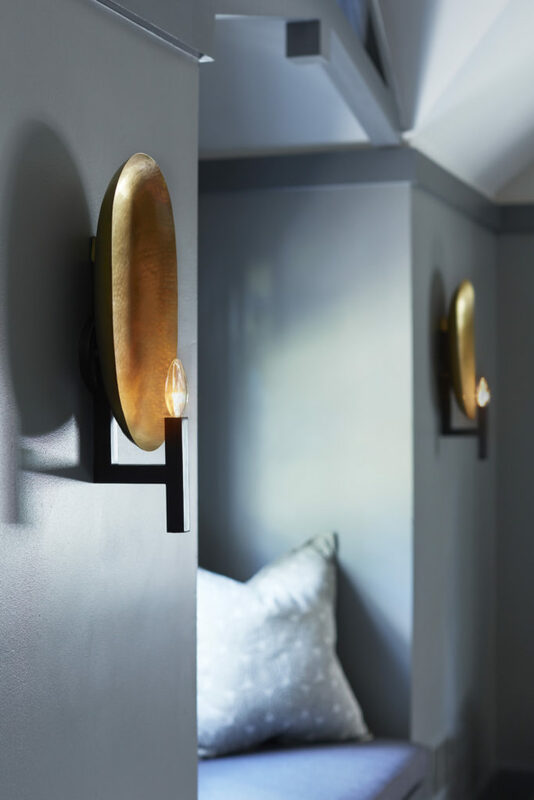 By using a darker color on the walls below the plate rail, this voluminous room feels grounded. Using the same paint color on the walls above the plate rail and the ceiling visually quieted down the multiple ceiling planes and angles. I refinished the floors to be warm and quiet—very soothing. 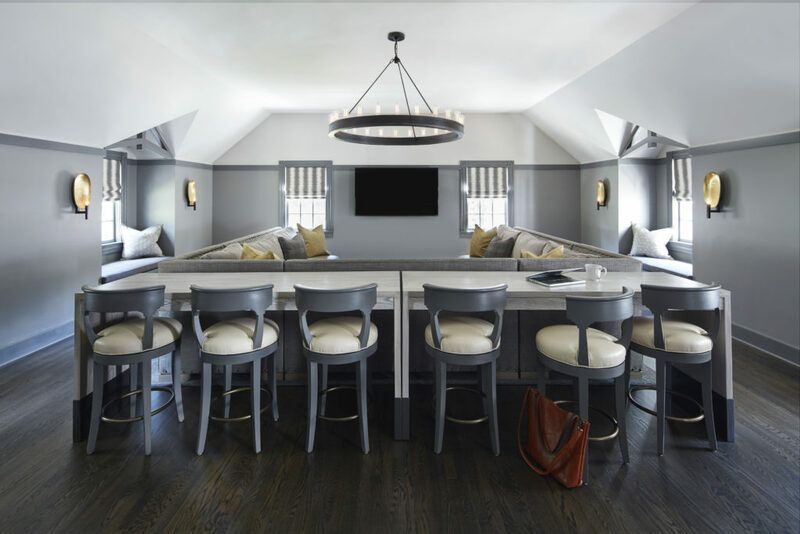 Above, counter-height tables by The Old Wood Co. are paired with Vanguard stools in Benjamin Moore‘s Kendall Charcoal. A pirch fit for pizza-eating tweens, to be sure. 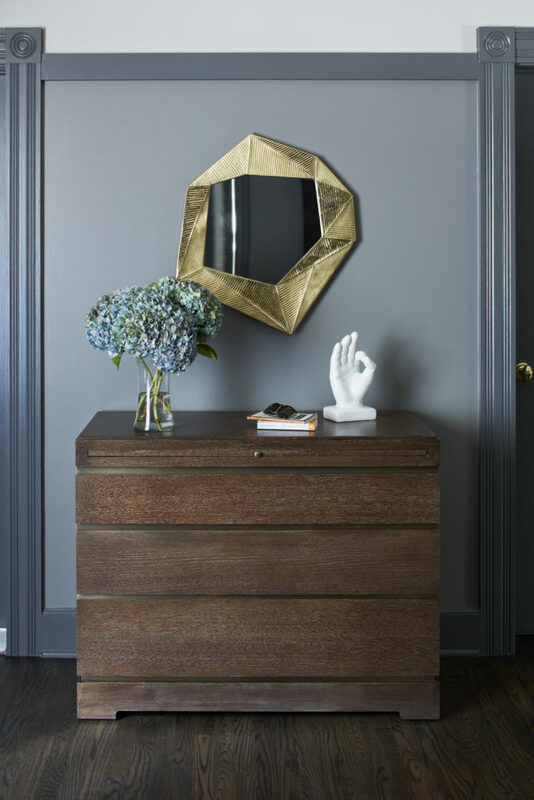 A bold color scheme allows statement-making pieces like this Pitney mirror by Arteriors to truly shine, while a streamlined Vanguard Cortland chest grounds the space. 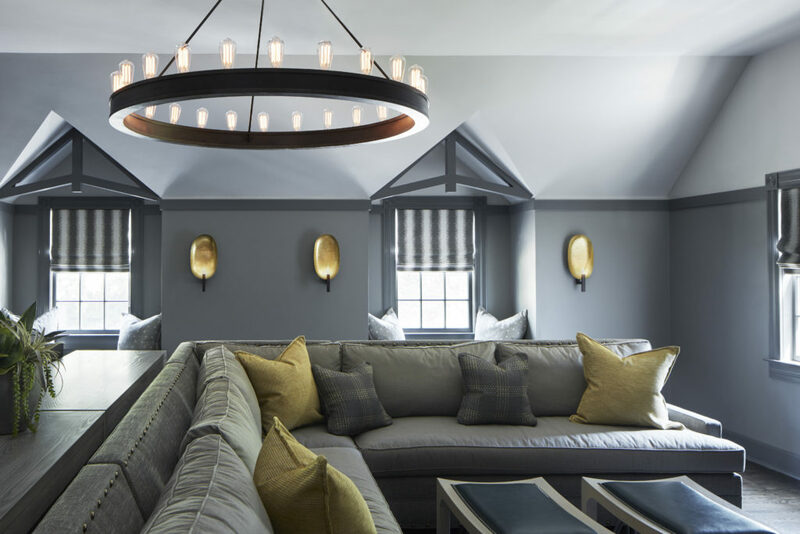 The lighting sets the tone of the space, infusing the room with warmth and tranquility. This project was incredibly rewarding. Colors, furnishings, and accessories worked cohesively together to create two harmonious spaces that make a major impact on the home. What’s so great about West Orange, New Jersey? The area is home to South Mountain and Eagle Rock Reservations, Turtle Back Zoo, The OSPAC Outdoor Amphitheater, and most notably, the Thomas Edison National Historic Park & Museum. It’s also home to beautiful residences of varying architectural styles, including colonials, capes, townhouses, and more. Easy access to New York City makes it a high demand area. Llewellyn Park is one of the oldest planned communities in America with beautiful pastoral landscapes and rustic charm. The park was founded in 1853 by businessman Llewellyn Solomon Haskell, and designed by highly influential architect Alexander Jackson Davis, who developed it in the same elegant, romantic vein as New York City’s Central Park. Famed inventor Thomas Alva Edison made his home here, building the nation’s first-ever movie studio on Main Street, and his home, Glenmont, and beloved laboratory still stand as a testament to his genius.